The McEwan family has been traced back to the early 18th Century, residing in Madderty and Fowlis Wester, both in Perthshire. 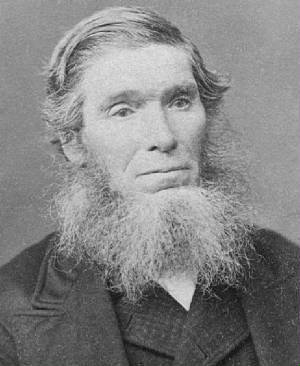 Peter McEwan was Calum's and Jamie's six times great grandfather. Peter was perhaps born approximately in 1750. The names Peter and Patrick are commonly interchangeable in 18th century Perthshire, and so it may be that he is the Patrick McEwan who was christened in Crieff on November 5th 1749. In favour of this theory is the fact that Peter named his first son Peter in 1774. The Patrick born in 1749 was the son of a weaver called Patrick McEwan, and if the naming pattern holds, with the first son named after the father's father, then this is a strong candidate. However, it is also possible that Peter was in fact married twice, initially to a Mary Wilson in 1757. The first three children of Peter McEwan and Mary Wilson were born in Arbenny, Madderty, the last two, Peter and Mary, were born in Westhill, which is where our Peter and his wife Janet lived and had their children shortly after. If this is the case, Mary Wilson must have passed away prior to March 1771. In Bessie MacLagan's 1932 "A Short History of an Ancient Parish", she mentions that the name Peter McEwan is written in a list of people connected with the old parish church at Madderty that was found in a sermon book kept by the Reverend James Ramsay, the son of the the minister of the church. Written in 1821, it is believed that this is either our Peter or his son, also called Peter. Peter and Janet had at least five children, who were raised in the parish of Madderty in Perthshire. 17 Jan 1774 - Peter McEwan and Janet Leetch in Westhill had a child born and next Sabbath named Peter. Peter married Janet Carmichael (born Abbey, Madderty 18/5/1788), daughter of James Carmichael and Helen Clark, on May 7th 1809, in Madderty parish (GROS: OPR M 378/20 515 Madderty). (John Scott died in 1857). Janet married Auchterarder road surfer man William Morrison (born 6/10/1805), eldest son of Douglas Morrison and Grizel McDougall, on December 22nd 1833, in Madderty, Perthshire, Scotland. The couple had ten children, all born in the Craig area of Madderty. Janet eventually died in 1856, whilst William survived until June 8th 1864, living in St. David's, Auchterarder. *** I have discovered many descendants of Janet and William in the last few years and have made a great deal of use from the research that they have already done, in addition to my own. Gregg Morrison was the first descendant of Janet McEwan discovered since this project began in 2000, and his help has been invaluable in charting our own history. Gregg's websites can be viewed at the following links: Gregg Morrison's Family Tree and Morrisons in Australia, USA, Canada & Scotland. Also, a big thanks to whoever entered their genealogical info to the Carmichael Family History Project, which lists further info on Janet's and Willam's descendants. This can be found at: Carmichael Family Tree 221. And finally another site listing info can be found at The Gregg Family History Project: Morrison. The following is taken from Greg Morrison's research on James Morrison. In the 1851 census, James was reported as living with the McEwan family in Hardfold, Madderty, Perthshire. But at some stage in the next six years he moved south from Perthshire, to Glasgow. James was married twice, his first marriage being with 20 year old Agnes McCulloch on December 31st 1857. Agnes was the 23 year old daughter of joiner John McCulloch and Mary McMillan and at the time of the wedding was living at 39 Crown Street, Hutchesonstown, Glasgow, as was James, who at that point was a journeyman joiner himself. The wedding was performed at 2 Apsley Place, Glasgow, in a ceremony according to the Free Church of Scotland, the minister being the Reverend Dugald MacColl, and the witnesses being Robert Livingstone and Douglas McCulloch (GROS:1857/644/9/12). The couple had three children, and at some point prior to July 1863 seem to have moved to Greenock in Renfrewshire. James migrated to the USA in approximately 1864. Gregg Morrison's website suggest that he may have travelled there with his uncle Peter McEwan, and his aunt, Helen Carmichael. Peter is known to have been in Dehi, Delaware in 1880, but the census records for Dehi would in fact seem to show him there as far back as 1850, and so it may be that James in fact travelled to stay with his uncle, rather than travel over with him in 1864. James arrived in Chicago and established a highly successful meat distribution business there, becoming quite wealthy in the process, and soon diversified into estate agency. At some stage in 1868 he married an Irish lady, who became Mrs Anna Jane Morrison - her maiden name is not known. In the 1870 Census for Cook County Chicago, Illinois (6th Ward, p.416, dwelling 1336) James Morrison was listed as a carpenter, with real estate value of $1200, and his personal estate at $200. Also listed were his wife Anna, aged 25, and his son Willie, aged 2, who was born in the state. The couple had three other kids, all born in Illinois, but in 1880, Anna died, leaving James with their upkeep. In 1888, James eventually died himself, whilst on a business trip to San Francisco in 1888. William was born at 7.10am on July 16th 1858 at 51 Muirhead Street in Hutchesonstown, Glasgow, Scotland. His father informed the registrar on the 19th (GROS:1858/644/10/1108). Mary was born in Hutchesonstown, Glasgow, Lanarkshire, Scotland. Janet was born in the Middle or New Parish of Greenock, Renfrewshire, Scotland. William was born in Chicago, Cook County, Illinois, USA on July 29th 1868. In approximately 1899, William married Blanche H. Hartman (born 14/2/1874, Illinois, died 12/2/1963). He is then to be found recorded at Main Street in the 1910 census for Edgerton, Rock County, Wisconsin (E.D. 106, sheet 7, lines 3-6). The census entry lists him as a 40 year old Scottish doctor (although the 1870 census listed him as 2 years old! ), and living in his rented property with wife Blanche, and daughters Ethel and Grace. William's parents were incorrectly stated to both be Scottish. In the 1920 census, William was living at 301 Albion Street, Edgerton City, Rock County, Wisconsin (E.D. 102, sheet 1, lines 82-85; dwelling 21, family 22). His profession was listed as Doctor - Medicine and Surgery, and also in the housewere his wife Blanche, his 13 year old daughter Grace, and his 8 year old son William. There is also listed at the same address (line 86) but in a seperate dwelling, an unreadable entry, which seems to state another Morrison family member: a single white female, with the age difficult to decipher, possibly 70, 75 or 15. Whoever she was, and however she may have been related, she was born in Wisconsin, of parents from Vermont. William died on July 12th 1941 at Edgerton, Rock County, Wisconsin, USA. Ethel was born in Illinois, USA on September 23rd 1899. She married Roy Hubert Marsden on February 22nd 1919 in Edgerton, Rock County, Wisconsin, USA. Roy was born February 22nd 1919 in Albion, Dane County Wisconsin. The couple went on to have three children. Ethel eventually passed away on July 7th 1963 in Albion, and was survived by her husband until his own death in Madison, Dane County, on May 14th 1989.
b: 23/11/1906 - Born in Edgerton, Wisconsin, USA. b: 1912 - Born in Edgerton, Wisconsin, USA. Florence was a highly reputed school teacher in Chicago. It is known that she visited relatives in Australia at the turn of the 20th Century, but it is not known who was specifically visited. Like her sister Florence, Grace was also a school teacher in Chicago. She married as a young woman, but it is not known who she married. Little is known of Helen's progress, but she died at some point in her teens, after collapsing due to overworking at college. Helen's mother died several years earlier, and I recall that Florence (Helen's sister) wrote to my mother that the last time Helen spoke, the nurse was washing her and she said, "That is good. Wash and dress me nice, Im going home to mother". Janet Morrison was present in Madderty, Perthshire, at the age of 14 when her mother died. Jessie Mae Brislen (see below) remembers her mother Mary Ann, who was 6 weeks old at the time, repeating what had been told to her about the moment of death. When Janet (the mother) knew she was going, she called to her daughter Janet and told her to take responsibility for her wee sister Mary Ann - "Take her Janet, she is yours now". On June 6th 1859, Janet married William Halley, a stone mason from Gavelmore Street in Crieff, Perthshire, and son of John Halley and Ann Carmichael. The wedding took place in St. David's, Madderty, and shortly after, the couple took Mary Ann to live with them for a few years. 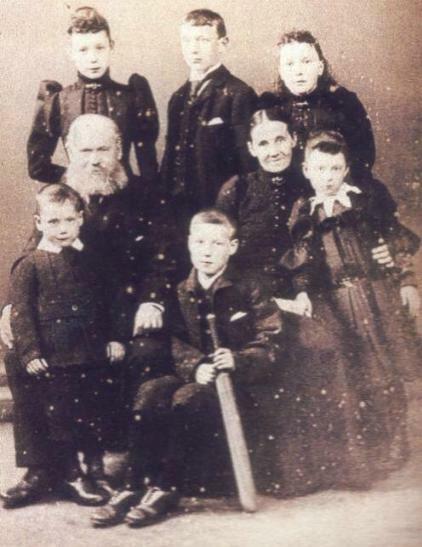 Janet and William had six children, most of whom may have migrated to Australia in later years. Janet died at 6.00am on August 29th 1872 at 7 Bedford Street, Edinburgh, the cause being dropsey and peretenitis of some three months. The informant to the registrar on the 29th was her husband, William (GROS:1872/685/1/934). William was born in Crammond, Edinburgh. Andrew was born in Crammond, Edinburgh. James was born in Edinburgh. William was born in Craig, Madderty, Perthshire, Scotland on January 1st 1839. He belonged to St.James Lodge of Freemasons in Perthshire Scotland, and spent much of his life in public service in the Borders town of Hawick. On Tuesday, January 14th 1862, William married 27 year old widow and poetess Margaret Gregg in South Leith, near Edinburgh, Scotland (IGI:M116921). Margaret born on Cumberland Street, Edinburgh, on September 13th 1834, as the only daughter of Robert Gregg and Jane Jack, had previously been married to compositor Alexander Lundie in Leith, Scotland, on June 6th 1857. Alexander had subsequently died in 1860, leaving Margaret to raise their only son, also called Alexander, who was born on August 16th 1859. Margaret was a poet of some reknown and a short biography of her appeared in the Third Series of Modern Scottish Poets - published 1881, in which Margaret claimed to have been 'orphaned at a very young age'. In the 1881 census, William and Margaret were recorded as living at Myrselaw House, Hawick, Roxburghshire (GROS:789/11/34). William, 42 years of age, was a printer and publisher born in Madderty, whilst Margaret, 46, employed 8 men and 9 lads. Also listed were there 21 year old stepson Alexander Lundie (from Margaret's previous marriage to Alexander Lundie), who was a newspaper reporter;their son William, a 17 year old compositor; their 15 year old compositor son Ivie; and their 17 year old Irish domestic servant Catherine Campbell. On Monday intelligence reached Hawick (in the form of a brief letter to Mrs Morrison) from Kent. Washington, United States, of the death of Ex-Bailie Morrison on 3rd August, and of his interment on the 5th, with Masonic honours. A prominent figure on the stage of local affairs has thus unexpectedly passed away. Mr Wm. Morrison had a somewhat remarkable career. He was born at Madderty, Perthshire; and was for some years a detective in the Leith Constabulary, receiving a gold watch on leaving. About 27 years ago he came to Hawick, and for 11 years filled the offices of Superintendent of Police and Procurator-Fiscal for the burgh, bringing a good deal of ability to bear upon the discharge of his professional duties. He was also Firemaster, and received a handsome gift in acknowledgment of his services in that capacity. About a year before he resigned these appointments in 1876 - he became proprietor of the Hawick Advertiser, in succession to the late Mr Jas. Haining. During the fourteen years he managed this business, he started two other newspapers, the Border Standard, published in Langholm, and the Hawick Advertiser, but both of these ceased to exist some years ago. He was also for a time a coal merchant in Hawick, and secretary of a society for the abolition of the State regulation of vice. His numerous private engagements did not prevent him from taking a prominent part in public affairs. For a dozen years at least he was a member of Hawick Town Council; and many being of opinion that his experience in the police department admirably fitted him for the bench, he was during the greater part of that period a bailie. When Provost Milligan resigned in November 1890, Bailie Morrison was a candidate for the premier honour. Provost Hogg being elected by a majority of only two votes. Besides all this, he was chairman of Hawick Parochial Board, and a member of the School Board. He was a member of Hawick Bowling Club, St James' Lodge of Freemasons, and other local societies. In politics he was a Liberal, and in various social movements he also took a leading part. About a year and a half ago, as noticed at the time, he suddenly left the town, and his whereabouts was for a considerable period, a matter of curious conjecture to those who had known him. Shortly before that time, he had made the advertiser a limited liability concern under the style of "W.Morrison & Co.," and the business is still carried on by this company. The deceased, who was 53 years of age, leaves a widow, who still resides in Hawick, and one son, who went abroad some years ago. Bailie Morrison possessed to a remarkable extent the faculty of ingratiating himself either with an individual or with a body of people, and invariably secured a considerable following for the various projects of one kind and another in which he interested himself. While in Hawick, he took an interest in almost every movement which enlisted the sympathies of any section of the community, and really did a good deal of service to the town in the various aspects of its municipal work, being not only a Bailie, but Convener of the Lighting Committee, besides representing the Council at the Gas Company's board. He had the gift in a unique degree of giving any scheme a most plausible appearance, and thus securing for it a corresponding amount of support from the public at large, completely capturing an unreflecting audience, and at the same time demolishing all opposition that was not very pronounced. Not only was he able to make others see a subject from the point of view that he desired them to take, but he seemed to be capable of working up in himself the firm belief that any undertaking he engaged in was the only and absolutely certain means of accomplishing the desired end. Whether at an evangelistic meeting, a Masonic social, a Town Council picnic, a philanthropic gathering, or a political demonstration, he appeared to feel fully convinced that he was the right man in the right place. Indeed. he seemed to have laid very deeply to heart the apostolic motto to be "all things to all men". It was almost impossible for any one to ruffle his outward composure. He met all opponents in public with the blandest of smiles, and evinced quite a fatherly solicitude for the welfare of his constituents. No one ever consulted him on any subject without taking away with him the impression that he was the man to rectify his grievance or help him towards the attainment of his object. Acting continually in the belief that it was possible to achieve success in business within a short time, not so much by hard work as by a clever combination of circumstances, he always strove to utilise the "tide in the affairs of men which, taken at the flood, leads on to fortune," and in the pursuit of this aim gave evidence of an astonishing fertility of resource. Such was Bailie Morrison as he was known to the public of Hawick during the quarter-of-a-century in which he lived amongst them. Further intelligence from America, contained in a letter from a brother of the deceased to another brother in Greenock, states that on the 3rd of August, Mr Morrison fell off a log, injuring himself so severely that he was unable to reach the house. One of his neighbours heard him calling for help, and found him lying at the side of the log. They carried him to the house, and he died in the evening at nine o'clock. He was interred by the Freemasons of Seattle on the 5th. Captain William B. Seymour of the Steamer Grace brought word of the death of WILLIAM MORRISON of Chico as the result of an accident Wednesday. Morrison was living on a ranch a little distance from the town. Edward Bethel, a neighbour of Morrison's, heard a noise like a man shouting in the woods behind Morrison's house Wednesday afternoon. As night came on, he still heard the noise and proceeded to see what the cause was. He found Morrison lying between two logs and in response to his inquiry as to what the matter was, he said he had been hurt by a log. Bethel and another man carried Morrison to his house, but he died by morning. Captain Seymour did not learn any more particulars, but he will bring the body over on the steamer this morning and it will be buried from Bonney and Stewart's undertaking rooms. Morrison was born in Scotland and was 53 years of age. He was a member of a Masonic lodge in Scotland, but whether he joined any lodge in this country is not known. He had a brother name James who is supposed to be somewhere in Washington. Andrew Morrison, William's brother, was appointed to administer his estate after death. Gregg Morrison in Australia has managed to trace the relevant court records, from microfilmed copies at the Kitsap County Courthouse, Port Orchards on November 14, 1989. Notice is hereby given that Andrew Morrison has filed in the Superior Court of Kitsap County, Washington, a petition praying for letters Of administration upon the estate of William Morrison, deceased. Know and these men present that we, Andrew Morrison as principal. and J.P. P. Shepherd and J. R. Hobbs as sureties are jointly and severally bound unto the State of Washington in the sum of Two Hundred Dollars. conditioned that the above bonded, Andrew Morrison, who has been appointed administrator of the estate of William Morrison, deceased. Order appointing administrator. William Morrison died intestate and the value of said estate does not exceed $100. Andrew Morrison of King County says that the estate consisted of real and personal property. The estate: A part of Lot 10 in Section 2, Range 24 North, Range I West, and the whole of Lot 11 in said section containing 44 acres. Value $540. Lot 1. Block 42, Port Washington, valued at $50. One (cabin?) # ($) 210 located within 10 (?) and some household property of no value. (see note:1) There is also some property in Scotland and its precise location is unknown. The deceased also received a homestead in Kitsap County. Total estate value this country, $602. That the next of kin of said deceased and whom your petitioner is advised and believes. Said deceased had a widow and one son aged about 26 residing in Hawich (sic Hawick); Scotland. (One other only living) The son, William Morrison resides in Sidney, (sic Sydney) Australia. The said petitioner is a brother of deceased. In August 2000, William's descendant William Douglas Morrison made a trip to Scotland and di some extensive research into William and Margaret's loife story. Their extensive account, including relevant photos, can be found on Gregg Morrison's website in an article entitled Tracing William's Footsteps. William was born at 6 Kirkgate, Leith, on August 9th 1863. William emigrated to New South Wales, Australia, arriving in Sydney on board the Pericles, on Christmas Eve 1883. He took up work as a New South Wales government printer. On April 22nd 1885, William married English woman Eliza Ann Appleton, originally from Durham, in a Church of England ceremony at Christ Church, Sydney. The couple settled initially in Victoria, where they raised a family, and ultimately ended up in Paddington, New South Wales, living at "Marwood", 29 Gordon Street. William died on March 11th 1913 at his Gordon Street home, and was buried at Rookwood Cemetary, Lidcombe. New South Wales. William's wife Eliza eventually died herself on September 14th 1942, at "Strathglass", 102 Lang Rd, Centenial Park, New South Wales, at the age of 83. Ivy was born September 9th 1886 in Gold Street, Brunswick, Victoria. On October 21st 1916, Ivy married Janie Priscilla Bastion in the All Souls Church of England in Leichhardt. Little is known of Beryl, other than that she married a gentleman of the name Tom Maple. William was born on March 28th 1888 at Strawberry Hills, Sydney. Throughout his lifetime he was more colloquially known as "Will" or "Morrie". William married 18 year old Edith Lydia Tattersell, daughter of Albert Tattersell and Norah Webster, on June 3rd 1914. Edith was born on March 4th 1896 in Randwick, New South Wales. William eventually died on June 20th 1956 in Engadine, New South Wales. Edith survived another 40 years, eventually dying at the age of 100 at Garrawarra Hospital, Waterfall, New South Wales, on March 28th 1986. Rob (William) was born on April 10th 1915 at "Balmoral", Australia St, Woolahra, New South Wales. On December 26th 1942, Rob married 29 year old Violet Pearl Elridge, in East Melbourne, Victoria, Australia. Violet tragically died on July 28th 1968, in Engadine, New South Wales. On November 7th 1970, Rob remarried to Edna Jane Fenton, in Engadine. Rob managed to survive until April 19th 1994, when he finally passed away in Gymea Bay, New South Wales. William was born on June 4th 1944 at Belmore, New South Wales, Australia. William is more colloquially referred to as "Doug". Doug married Estelle Irene Phillips on September 3rd 1966, in Hurtsville, New South Wales. It was Doug who did the initial research into the Morrison family history that was later taken up by his uncle Gregg and cousin Ewan, and which has been the basis of most of the information on the Morrisons recorded here. Rachel was born on September 17th 1996 at Kogarah, New South Wales, Australia. Rachel married Robert Morgan on March 30th 1996, in Gladesville, Australia. Hannah was born at 10.30pm on January 1st 2003. Carla married 30 year old Steven Mark James on May 6th 2000, at St Ignatius College, Riverview, Australia. Peter married Janice Elizabeth Montgomery on April 30th 1977, in Huntsville, New South Wales. Although the couple have no children of their own, Peter is the stepfather of three children from Janice's previous marriage. They are Steven Mark Bear, Andrew Paul Bear, and Renee Elizabeth Bear. Mark married 21 year old Susan Lee Florey on August 23rd 1980, in Waratah, Newcastle, New South Wales, Australia. Jessie was born on July 20th 1917 in Paddington, New South Wales, Australia. On May 7th 1949, Jessie married John Douglas (Darby) Fortey in Sydney's Scots Church. John died on September 17th 1996 in Caringbah, New South Wales, Australia. Donella was born on May 27th 1951 in the Crown Street Women's Hospital in Sydney, Australia. On September 27th 1971, Donella married 25 year old Robert Eric John Beh (born October 3rd 1944), better known as "Bob". Eric married Shoalhaven woman Rosemary Heather Ferguson on March 16th 1995. Emma married Gavin James Blacka. Lindon was born on July 29th 1953 in Engadine, New South Wales, Australia. Sarah was born at the Simpson Memorial, Edinburgh, Scotland, on November 27th 1977. Shortly after her birth, she was the youngest baby at the time to fly LONSYD, aged 17 days old. Jean was born on January 7th 1919 in Randwick, New South Wales, Australia. Jean eventually died on June 5th 1920, at Prince Henry Hospital, New South Wales. Donald was born on May 20th 1922 in Maroubra, New South Wales. On July 9th 1949 Donald married 21 year old Nita Stageman in St Stephen's Presbyterian Church, Sydney. Ewan was born on June 9th 1951 in Engadine, New South Wales, Australia. Ewan married 22 year old Dianne Elizabeth Sharpe on October 24th 1975 (Dianne was born on November 2nd 1952). Garth was born in Smithfield, New South Wales, Australia. Danielle was born in Smithfield, New South Wales, Australia. David was born on July 15th 1955 in Engadine, New South Wales, Australia. David married Ann Bronwyn Ludwig on November 19th 1977 in the Presbyterian Church of Caringbah, New South Wales, and the couple produced a son. It is not known what ended the marriage. He later married Raelene Terese Keelan, but the couple produced no children. It is not known what ended this marriage. On November 9th 1991, David married then for a third time to Sherryl Fay Carr, at St Peter's Anglican Church, Campbelltown, New South Wales. The couple had one son together. Ryan was born in Campbelltown, New South Wales, Australia. Eunice married 32 year old Colin Roberts Clarke on January 7th 1950, at the Presbyterian Church in Sutherland, New South Wales. Colin died on July 9th 1984 - it is not known whether Eunice is still alive. Crystal married Ross Anthony Grisdale on September 22nd 1972 in Lakemba, New South Wales (Ross was born on June 7th 1950). Priscilla was born in Engadine, New South Wales, Australia. Priscilla married Stephen John Myles on December 13th 1975 in Lakemba, New South Wales. Bruce was born on April 9th 1928 in Maroubra, New South Wales. On March 8th 1952 Bruce married Lorna May McDonald, in St. Matthew's Church of England, Bondi. Craig married Helen Maria Nairne on September 24th 1988 in Gulgong, New South Wales (Helen was born February 4th 1954). Janine married Timothy Richard Lillas on September 28th 1985, in St. Paul's, Burwood (Timothy was born August 14th 1958). Gregg was born on June 10th 1931 in Sydney, Australia. In 1949 Gregg met Muriel Davies in Engadine, New South Wales. Gregg was employed as in Registered Nurse. The couple had a child, Lorraine, but did not marry. They went their separate ways and their daughter was raised by Muriel. On June 21st 1952 Gregg remarried to Joyce Mavis Christian in Sydney, Australia, and the couple went on to have four children. On May 23rd 1975, Gregg married for a third time, to Kerry Dawn Charlton (nee Elvins), again in Sydney. Kerry has three children by her first marriage to Noel Walter Charlton. They are Kevin Maxwell Charlton, Gary Walter Charlton and Alan Richard Charlton. "Lorraine did not know that the man she believed was her father was not, until she was in her 30s. She waited until after his death, and she was in her late 40s, to search for her birth father. She made contact with Gregg for the first time on New Years Eve 1999 and they met for the first time in January 2000. Lorraine and her daughter Morgan met the Morrison family on 20 May 2000 at her father Gregg and his wife Kerry's 25th Wedding Anniversary and Family Reunion." Lorraine's current partner is a Manxman called Iain Crellan. She also has a daughter. Morgan was born in South Australia. Ian was born in Sydney, Australia. Ian married Susan Margaret Nash on December 9th 1983 in Sydney, Australia. Katya was adopted by Ian and Susan. Kel was born in Sydney, Australia. Kel married Helga Ossington on December 12th 1977, with whom he had two children. Kel later married Tina Noon and had a further child. Lachlan was born in Sydney, Australia. Lachlan married Margaret Hutchinson on January 3rd 1981 in Sydney, Australia (Margaret was born on November 16th 1957). Naomi was born in Engadine, New South Wales, Australia. Naomi married David Collins on March 1st 1986 in Sydney, Australia, but later divorced him. Naomi continues to work in Australia today as a veterinary nurse. Gordon was born on October 10th 1933 in Engadine, New South Wales. Gordon married Margaret Osmond Ray on June 22nd 1957 in St.George's, Hurstville, New South Wales. Grant is officially the Reverend Grant Morrison, and was the Youth pastor at Carlton Kogarah Baptist Church from 1987 to 1990. From 1990 until 1994, he was at the Kempsey Baptist Church, and then from 1994 to 1996 the Turramurra Baptist Church. Since 1996 Grant has been at Maitland. Grant married Susan Louise Allanson on January 22nd 1983. Susan is the Internal Auditor for Newcastle City Council. She was peviously with the New South Wales Treasury and the Audit Office of New South Wales. Finley married 22 year old Debra Lee Lewis on August 6th 1989 in Orange, New South Wales. Yvonne married Walter Maxwell (Max) Ward on November 26th 1960 in Perth, Western Australia. Yvonne is a brilliant artist, and her work, which covers a variety of subjects on canvas, china, etc, can be seen at the following page of Gregg Morrison's website: The Artist. Yvonne can be contacted by e-mail at Yvonne Ward. John has at least one daughter. Graeme married Norah Irene Bratt on December 5th 1958 in Penshurst, New South Wales. Ross married Donna Marie Corr on December 6th 1980, in Sutherland, New South Wales. Murray was born in Engadine, New South Wales, Australia. Murray married 23 year old Tracey Ann Crocker on July 29th 1989, in Engadine, New South Wales. John was born on February 12th 1890 in Sydney, Australia. On October 14th 1916, John married 28 year old Edith Caroline Young, in St. Clements, Marrickville, Australia. The couple went on to have a family of four children. John died on October 13th 1940, in Stanmore, Sydney. His wife Edith survived until 1964. Gwenda married Leslie James Hyde on January 10th 1942, and went on to have four children. Dianne married Geofrey William Atkinson on September 17th 1966, and went on to have three children. Allen married Robyn Anne Taylor on May 19th 1979, and had two children. Gregory married Julie Margaret Pearce on May 20th 1978. Margaret married Ross Arthur Smith on December 28th 1979. The couple currently are known to have one child. Allen married 33 year old Dorothy Ross on March 5th 1955. The couple had one child. Rosslyn married Brian Reilly on April 19th 1978, and the couple have one child. Jean married Ronald Piper on November 12th 1949 in the Holy Trinity Church of England, Dulwich Hill, Australia. The couple had three children. Janeen married Terry Clifton and had three children. Denise married Garry Edwards and had four children. 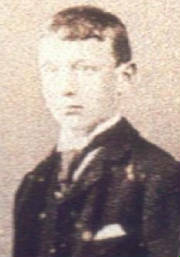 William married Gail Harris and had four children. Betty married Reginald Wall on September 18th 1948 in St. Clements, Marrickville, Australia. Suzanne married Graham Parker on April 15th 1972, and had three children. Nothing is as yet known about John. Eliza tragically died in infancy. Robert married Florie Parnell and had at least four children. James was born on January 12th 1899 in Leichhardt, Australia. He died on July 25th 1916 in Pozieres, France, during the First World War. who died aged 17 on Saturday 22 July 1916.
of "Marwood", of 29 Gordon St., Paddington, New South Wales. Eunice only survived for six years, and was subsequently buried with her father in Rookwood Cemetery. Eliza, known colloquially as "Annie" was born on November 12th 1904 in Leichhardt, Australia, and named after her deceased sister. She married Norman Willets. Reginald was buried alongside his mother in Rookwood Cemetery. Robert was born in Kirksgate Leith on December 5th 1864, but died in infancy the following month. 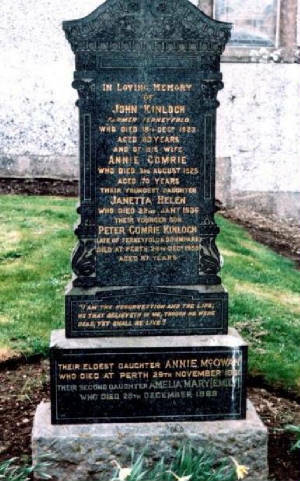 Ivie was born in Kirksgate Leith on December 1st 1865. He worked as a newspaper clerk, but tragically died of lupus at Myrselaw House, Hawick, Roxburghshire, on December 3rd 1886. He was 21. Robert was born at 12 Lochend Road, Leith, but like his namesake brother, he did not survive infancy. He died on May 10th 1867 in Leith. 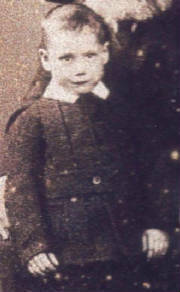 James was born at 40 Coatfield Lane, Leith, on February 2nd 1868, but died tragically in infancy on July 10th later in the year. Margaret was bon at 4 Dovecot Street, Hawick, Roxburghshire, on September 23rd 1869, but like most of her brothers and sisters, died in infancy, later in the same year. Peter was born on August 13th 1840 in Craig, Madderty, Perthhsire, Scotland, and baptised there on the 23rd. In 1862, Peter was a witness to his brother William's Marriage in South Leith, Scotland. Peter emigrated to the USA, initially it is believed to Chicago. He took up work as a private detective and in 1870, in his late 20s, he was shot and killed in an ambush by a criminal he was pursuing in West Kansas. John was born on July 20th 1843 in Craig, Madderty, Perthshire, Scotland. John became a school teacher and eventually the headmaster of Greenock High School in Scotland. For five years after that he taught at Gobroch, before migrating to the USA in 1915 with his sister Hellen. Upon their arrival they lived for a time with their brother Andrew in Seattle, Washington, with Hellen acting as their housekeeper. John tried to set up various businesses, but was not very succesful. In the aftermath of their home being burgled and ransacked, John and Hellen decided to move into Kenney Presbyterian Nursing Home, Seattle. It was here that John died, in about 1925. He never married. Grace was born on December 23rd 1845 in Craig, Madderty, Perthshire, Scotland. She emigrated to the USA, settling in Rockford, Illinois, and married a wealthy farmer called Charles Pickens, who was quite a bit older than her, and with whom she raised a family of three children. At some stage before in the 1870s, Grace suffered a fall that caused her to suffer several broken ribs and punctured her lungs. The injury caused her to develop a serious lung ailment, so serious that her sister, Mary Ann, returned to Illinois from Kansas to look after her, bringing her own young son with her. Mary Ann looked after Grace for several months, but in 1879 Grace was to finally die from the injury. Anetta was more colloquially known as "Netta". She grew up to marry John McDonald, with whom she raised a family of four children. Margaret, better known as "Maggie", was born in St. David's, Madderty, Perthshire, Scotland. At the age of 20, Maggie and her twin brother Andrew emigrated to the United States of America, arriving initially in Illinois. Whilst Andrew moved out west to Decatur County in Kansas to take up some land, Maggie stayed to help her sister Grace for a while, before ultimately joining Andrew in Kansas. Maggie married Ben Butler and had four children, two of whom died in infancy. She lived the rest of her life in Beloit County, Kansas. John married and raised a family at Larned, Kansas. Andrew was born on August 26th 1847 in St. David's, Madderty, Perthshire, Scotland. Andrew and his twin sister Maggie migrated to the USA in the mid 1860's, staying initially with their sister Grace in Rockford, Illinois. Andrew moved to Kansas and purchased property there, before selling up and moving on to King County, Washington, where he operated a timber property at Puget Sound, which he may have obtained from the Estate of his brother William, who was killed there in 1894. Andrew attended William's funeral and made all the arrangements about the disposal of hisproperty. It is not know if Andrew ever married or had kids. It is known that he owned some land in Seattle,and that he died there on March 8th 1921. He had wanted his sister Maggie to have his estate, but for some reason she never received it. Hellen was born on June 17th 1849 in St. David's, Madderty, Perthshire, Scotland, and for several years battled with ill health as a child, and remained quite frail throughout her life. Hellen acted as housekeeper for her brother John whilst he worked as a teacher in Greenock, and later on when he worked in Gobroch, Scotland. Hellen migrated to the USA with John in about 1915. She never married, and it is believed that she was a resident of the Kenny Presbyterian Home in Seattle, Washington, until her death there in September, 1931. Hellen's niece Jenny Mae Brislen recalls (on Gregg Morrison's website) "We have all had a kindly feeling toward this Auntie, her Christmas packages helped brighten things a lot when we were young". Mary was born on September 24th 1854 in St. David's, Madderty, Perthshire, Scotland. Her (Mary Ann) mother died when she was six weeks old, and her early life had a great many hardships. 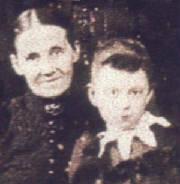 When her sister Janet married at 18, she took the four year old Mary Ann with her to a new home in Scotland, and remained there until she was nine her brother (John) decided she was being overworked and took her to a sister of their mother, (Helen McEwan), who promptly put her to work in a mill. (This auntie used to smoke a pipe secretly!). 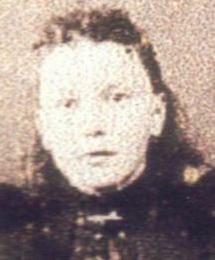 Mary Ann then spent some time at home with her father until his death in 1864. After that, her brother John made a home for her until she was around 16, when she left to go to work. She was heard to say that she was never happier in her life than while she was second maid for a family who lived in an old castle. She had the tower room, and loved to tell about those days. In 1873, Mary Ann sailed for America, staying initially with her sister, Grace, in Rockford, Illinois. Three years later Mary Ann married Neil Brislen. The couple moved to Plymouth, Kansas, in 1878, to a farm four miles north of the town, where they raised a family. After living in Plymouth for a little over a year, Mary Ann Morrison and Neil Brislen bought and moved to a farm north of the little town, where they lived until 1910. Kansas was practically frontier the earlier years of their life there crop failures and many other hardships took their toll through the years, leaving her something of an invalid, house bound through the winter months, away back in my memory. Although like a dream, I recall thinking she was very pretty in her old brown taffeta dress, and a little bonnet she wore this was when I was a small child. In November of 1910, the parents of Grace (Mary Ann & Neil Brislen) moved to Pasadena, California. This is where Grace died early in 1931. She loved beautiful things and craved a good education for her family. Her life was not easy. Mary eventually died on March 31st 1931 in Pasadena, California, USA. Jessie married someone, name unknown, in 1906. It is thanks to Jessie's contact with her Australian cousin Gregg Morrison that so much is known about her family. Peter was born in Hardford on November 16th 1811. Peter emigrated to the United States of America at some point, possibly with his sister Helen McEwan. In the 1850 census for Delhi, Delaware, New York State, Peter is listed as a 39 year old Scottish farmer, with 37 year old wife Isabel, also from Scotland. Also in the house were 3 year old Sarah G. McEwen, 6 months old Ann McEwen, and 17 year old labourer William Middlemesh, also from Scotland. The real estate value was $1000. Ten years later, in 1860, the family are again found in Delhi, Delaware. In this case Peter is a 48 year old Scottish farmer, with real estate to the value of $1500, and personal estate valued at $900. Isabella McEwen, a 6 year old Scot is listed, again presumably his wife, and then the children - Sally M. McEwen aged 12, Anna aged 10, Peter Jr aged 8 and Ellen, aged 3 - again, all listed as born in New York State. In the 1870 US Federal census for New York State, a 58 year old Peter McEwen is listed as residing in Delhi, Delaware, as a farmer with real estate worth $8000, and with US citizenship. In the same household were Sarah McEwen, as 22 year old house keeper, 20 year old Ann McEwen keeping house, 18 year old Peter McEwen at home, and 13 year old Ellen McEwen, at home. All bar Peter senior are noted as having been born in New York. In 1880, Peter McEwan Jr is the head of the household, listed as a 28 year old farmer in Delhi, with his wife Anna, aged 26 and from Scotland. Also present were his daughters Isabella M. McEwan, aged 2, and 1 year old Jessie M. McEwan. His father Peter senior was also there, aged 69 and by now a widower. The 1890 census was unfortunately destroyed by fire, and cannot be consulted. James was christened in Madderty in 1816. James McEwan in the Parish of Madderty and Janet Simmie in the Parish (five days) 3rd May 1851. James McEwan in the Parish of Madderty and Janet Simmie in the Parish (two days) 3rd May 1851. The couple went on to have at least six children. In the 1861 census, James and Janet were resident at 71 Princes Street, Dundee, with James listed as a 46 year old wright born in Madderty, and Janet as 36, and from Methven in Perthshire (Ancestry 1861 Census 1861 282/1 26). In 1881, James is again listed as a 66 year old cartwright from Madderty, residing at 25 Robertson Street, St. Andrew, Dundee, with his wife Janet, aged 56, and four of his children, Mary, Janet, John and Andrew (Ancestry 1881 Census Dundee 282/4 ED 18 p.16). James eventually died at 95 Johnston Street on 15 APR 1883 in the St. Andrews district of the burgh of Dundee. His wife was recorded as Jessie SIMMIE, and the informant to the registrar on the 16th was his son John. The cause of death is illegible. His father was noted as a cartwright on the cert, though a word after this description also remains illegible (GROS D 1883/282/462). Peter was born in Madderty in about 1851 or 1852, as noted from the 1861 Census for Dundee, where he was resident at 71 Princes Street. His birth is not listed at the GROS or on the IGI, suggesting his family may have been dissenters. On this census he was noted as a scholar (Ancestry 1861 Census Dundee 282/1 26 line 2). William was born in Madderty in about 1853 or 1854, as noted from the 1861 Census for Dundee, where he was resident at 71 Princes Street. His birth is not listed at the GROS or on the IGI, suggesting he may his family may have been dissenters. He was noted as a scholar (Ancestry 1861 Census 1861 282/1 26 line 3). Mary was born at Newmiln, Scone, Perthshire at 1.00am on August 2nd 1855. her father James was noted as a 40 year old wright, born in Madderty, and her mother as Janet Simmie. The couple are noted as having married in Madderty in 1851, and as already having had two sons. The birth was registered in Scone on August 10th by Mary's father (GROS B 1855 394/00 0030). In the 1861 Census, Mary was 5 years old and living at 71 Princes Street, Dundee (Ancestry 1861 Census 1861 282/1 26 line 4). In 1871, Mary was recorded as a 15 year old factory worker at 11 Craigie Street, in the St. Andrew district of Dundee. (Ancestry: 1871 Census Dundee 282/4 ED 27 p.3). In 1881, Mary was listed at 25 Robertson Street, St. Andrew, Dundee, as a 25 year old jute weaver(Ancestry 1881 Census Dundee 282/4 ED 18 p.16). Janet was born at 2.00am on February 14th 1858 at 238 High Street, Perth. Her father James was noted as a cart wright, and her mother Janet Simmie McEWAN was the informant to the registrar in Perth on March 15th (GROS B 1858 387/1 0182). In the 1861 Census, Janet was 3 years old and living at 71 Princes Street, Dundee (Ancestry 1861 Census 1861 282/1 26 line 5). In 1871, Janet was recorded as a 13 year old factory worker at 11 Craigie Street, in the St. Andrew district of Dundee (Ancestry: 1871 Census Dundee 282/4 ED 27 p.3). In 1881, Janet was listed at 25 Robertson Street, St. Andrew, Dundee, as a 23 year old flax spinner (Ancestry 1881 Census Dundee 282/4 ED 18 p.16). Jean was born on July 6th 1861 in Dundee (Source: IGI). She was noted in the 1861 census for Dundee as having been born in the city in 1860, and as being resident at 71 Princes Street (Ancestry 1861 Census 1861 282/1 26 line 6). John was born at 1.00am on 8 JUL 1862 at 73 Princes Street, Dundee, Angus. His father James was recorded as a mill wright (journeyman), his mother as Janet SIMMIE, and the couple married 15 MAY 1851 at Madderty. James informed the registrar in Dundee on 28 JUL 1862 (GROS B 1862 282/01 1028). In 1871, John was recorded as an 8 year old scholar at 11 Craigie Street, in the St. Andrew district of Dundee (Ancestry: 1871 Census Dundee 282/4 ED 27 p.3). In 1881, John was listed at 25 Robertson Street, St. Andrew, Dundee, as an 18 year old sawyer (Ancestry 1881 Census Dundee 282/4 ED 18 p.16). Christina was born on December 12th 1866 in Dundee (IGI). Christina tragically died at the age of nine months at 11.20am on 20 SEP 1867 at 23 Cotton Road, Dundee, the cause being diarrhoea of 12 days, as certified by Peter Young. Her father James was recorded as a millwright, and he informed the registrar on the same day (GROS D 1867 282/01 1002). Andrew was born on at 5.00pm on 8 OCT 1869 at 11 Craigie Street. His father was recorded as a journeyman joiner, and his mother as Janet SIMIE, and it was she who registered the birth on 21 OCT 1869 (GROS B 1869 282/04 1172). In 1871, Andrew was recorded as a 1 years old at 11 Craigie Street, in the St. Andrew district of Dundee (Ancestry: 1871 Census Dundee 282/4 ED 27 p.3). In 1881, Andrew was listed at 25 Robertson Street, St. Andrew, Dundee, as an 18 year old scholar(Ancestry 1881 Census Dundee 282/4 ED 18 p.16). Helen also emigrated to the United States. William was born in Madderty, Perthshire, and was to become a soldier in the 72nd Regiment of Foot. He joined on March 17th 1801, aged 24, and was discharged August 4th 1822 at Horse Guards, Woolwich, the reason being that he had chronic rheumatism. At the time of his discharge, he was five foot ten and half inches tall, had sandy hair, blue eyes, and was a weaver by trade. His discharge papers contain his own signature, showing he was literate. The papers also show that William served in either the East or West Indies between November 25th 1810 and June 27th 1814, and then again on September 2nd 1815 until February 17th 1816 (TNA: WO97/842). Subsequent to his discharge, the 1841 and 1851 census returns list William as a Chelsea Pensioner, meaning that he was a retired soldier. He lived with his brother Andrew in Bellyclone. Andrew married 23 year old Fowlis based woman Ann Reid, daughter of farmer James Reid and Catherine Robertson, on 16th July 1815 in Madderty. Andrew worked as a wright, and after the wedding he raised a family with Ann in Bellyclone area of St. David's district of Madderty parish, where they remained for the rest of their lives. In 1841, Andrew is recorded in the census at Bellyclone as a 60 year old carpenter, along with his wife Anne, 45. his brother William (P. Army, meaning "army pensioner"), and his children, James aged 20, Mary aged 10, and John aged 8 (Ancestry: 1841 Madderty ED3, p.4). In 1851, Andrew is again recorded at Bellyclone as a 72 year old wright, along with his wife Ann aged 60 (born Trinity Gask), his brother William aged 75 (Chelsea Pensioner, late soldier, 72nd Foot), and his son John, a 21 year old wright, and daughter Mary, a 22 year old dressmaker (Ancestry 1851: Madderty, ED3, p.9,line 3). Having spent the whole of his life working as a wright, Andrew finally died in St. David's, Madderty, in 1853, although with civil registration not coming into effect until two years after his death, details about the cause are not known. Andrew's widowed wife Ann continued to live in St. David's until her own death two years later, on April 17th 1855. The death entry in the register tells us that she had lived in St. David's, Madderty, for 15 years, and that she was born in Fowlis. It also lists her seven children (see below) and the cause of her death was dramatically listed as "instant death" with no medical attendant. She was buried in Madderty, presumably alongside her husband. The informant to the Madderty registrar on April 26th was her youngest son, John (GROS:1855/378/00/3). ** A modern day descendant of Andrew McEwan and Ann Reid is Annie Comrie Crook, who can be contacted at 60 Needless Road, Perth, Scotland, PH20 LA. Annie's research can be accessed as an ancestral file on the website of the Church of Jesus Christ of Latter Day Saints. Key in a wedding date search for Andrew and Ann, and the connections between them and the modern day descendants can be viewed. Again, many thanks to Annie, whose own research has been phenomenal. Jean was christened in Madderty on April 12th 1812. James was christened in Madderty on July 15th 1816. Peter was christened in Madderty on January 3rd 1819. Peter married Agnes McINTOSH in December 1844 at Auchtergaven, Perthshire (Source: S. Edgar). Annie was born in Madderty, Perthshire, and christenend in the parish on February 25th 1821. Annie married Peter Comrie (born 18/5/1815 in Fowlis Wester, Perthshire) on April 16th 1843, in Muthill, Perthshire, and settled at Drummie Farm, Fowlis Wester, Perthshire. Annie eventually died on August 21st 1873 at 4.10am at Drummie, having suffered from an uncertain disease of the stomach, as certified by Dr James Gairdner. Her husband Peter informed the registrar on the 26th. 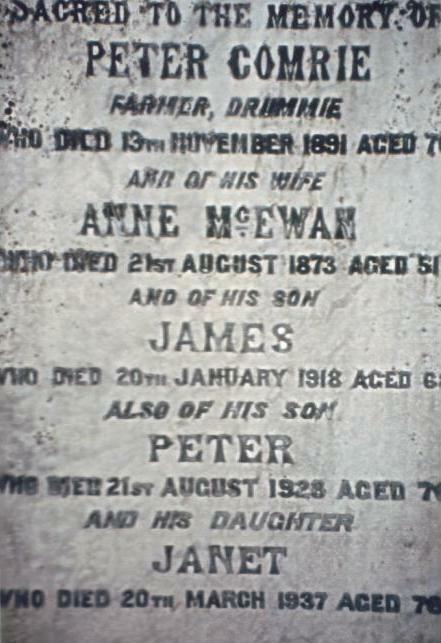 Peter himself died on November 13th 1891 in the farm at Fowlis Wester. Both Annie and Peter are buried in Fowlis Wester graveyard, Perthshire. Sacred to the memory of Peter Comrie, farmer, Drummie, who died 13th November 1891 aged 76, and of his wife Anne McEwan, who died 21st August 1873 aged 51, and of his son James who died 20th January 1918 aged 68, also of his son Peter who died 21st August 1928 aged 76, and his daughter Janet who died 20th March 1937 aged 78. William was born at Fowlis Wester, Perthshire, Scotland, on June 14th 1843, and was baptised at Methven on July 2nd 1843. William went on to become a farmer, and on March 5th 1878 married Isabella Pirney (born 1843) in Crieff, Perthshire. Andrew was born in Muthill, Perthshire, Scotland, on March 28th 1845, and grw up to become a farmer at the family farm of Drummie. 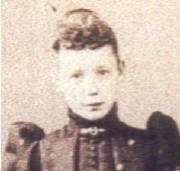 Andrew married Janet McPherson (born 1845), and the couple went on to have five children. In the 1901 census, Andrew is described as a 55 year old farmer resident at Drummie Farm, Fowlis Wester. Also present were his 53 year old wife Janet his five children, his brother Peter, described as a "Farmer's Brother", and a farm servant, David Allan, aged 14, from Errol in Perthshire (GROS:1901/357/2/1). Andrew eventually died at Drummie Farm on July 26th 1906, and was buried in Fowlis Wester Cemetery. His wife Janet passed away at Drummie on May 30th 1927. Helen was born in Fowlis Wester, in Perthshire, on 3 MAY 1874. On 26 MAY 1879, Helen started school, though unfortunately the school's name is not noted in the surviving register now hosted on Ancestry (Registers of Admissions and Withdrawals, CC1/5/8/91. Perth & Kinross Council Archive, Perth, Scotland). Her father was noted as Andrew Comrie, her date of birth as 3 MAY 1874, and her address as Fowlis. No previous school has been attended, and her date of leaving was not noted. In the 1881 census, Helen was recorded as a six year old scholar at Fowlis Wester (GROS:1881/357/1/4). And in the 1901 census, aged 26, Helen was recorded with the family as a Farmer's Daughter, and a worker, at Drummie Farm, Fowlis Wester (GROS:1901/357/2/1). On 19 AUG 1920, Helen married 48 year old farmer John Murray Ritchie at Shannocher, Fowlis Wester, with Helen noted as a spinster. John was the son of the late Robert Ritchie, farmer, and Euphemia Gordon Drummond Murray, and was resident at Tail Farm, Fowlis Wester. The minister was J. Crystal Muir and the witnersses, Annie McEwan Comrie and Nicol Sinclair. The wedding was registered on 20 AUG 1920 at Fowlis Wester (GROS M 1920 357/00 004). John eventually passed away in 1944 at Fowlis Wester, with Helen surviving until 1971. Peter was born in Fowlis Wester, Perthshire on 14 FEB 1876. On 2 MAR 1881, Peter started school, though unfortunately the school's name is not noted in the surviving register now hosted on Ancestry (Registers of Admissions and Withdrawals, CC1/5/8/91. Perth & Kinross Council Archive, Perth, Scotland). His father was noted as Andrew Comrie, his date of birth as 14 FEB 1876, and his address as Fowlis. No previous school has been attended, and his date of leaving was not noted. In the 1881 census Peter was recorded as a five year old scholar in Fowlis (GROS:1881/357/1/4). And in the 1901 census, he was recorded at Drummie Farm as a 25 year old Farmer's Son, and a worker (GROS:1901/357/2/1). Peter continued working at Drummie Farm throughout his life. He eventually died on February 18th 1967 and was buried in Fowlis Wester Cemetery. John was born at Drummie Farm, in Fowlis Wester, Perthshire, at 3.00pm on 11 FEB 1878. His father was Andrew COMRIE, farmer, his mother Janet MacPHERSON, married 31 DEC 1873 at Fowlis Wester. His father informed the registrar at Fowlis Wester on 2 MAR 1878 (GROS B 1878 357/00 003). On 15 JAN 1883, John started school, though unfortunately the school's name is not noted in the surviving register now hosted on Ancestry (Registers of Admissions and Withdrawals, CC1/5/8/91. Perth & Kinross Council Archive, Perth, Scotland). His father was noted as Andrew Comrie, his date of birth as 1878 only, and his address as Fowlis. No previous school has been attended, and his date of leaving was not noted. John became a farmer and married Jeanne Elizabeth Crawford in Perth in 1920. The couple remained at Drummie until their eventual deaths. Jeanne passed away on October 24th 1933, whilst John survived until March 8th 1959. Both were buried in Fowlis Wester Cemetery, Perthshire. Andrew was born in Fowlis Wester, Perthshire, in 1921. Andrew married Kathleen Taylor in Perthshire in 1954 and had at least two children. Charles was born on November 23rd 1954 in Perthshire, Scotland. He married Caroline Foster on November 5th 1990, again in Perthshire. Crawford was born in Perthshire, Scotland on July 23rd 1957. In 1981, Crawford married Jan Thom in Perthshire. The couple currently have three children, all born in Perthshire. Annie was born in Fowlis Wester, Perthshire, on 4 APR 1880 and lived her life at Drummie Farm. In the 1881 census, she was recorded in Fowlis as an eleven month old baby (GROS Cen :1881/357/1/4). On 8 JUL 1885, Annie started school, though unfortunately the school's name is not noted in the surviving register now hosted on Ancestry (Registers of Admissions and Withdrawals, CC1/5/8/91. Perth & Kinross Council Archive, Perth, Scotland). Her father was noted as Andrew Comrie, her date of birth as 4 APR 1880, and her address as Drummie. No previous school has been attended, and her date of leaving was not noted. Her name appears to be noted as Annie C. Comrie. In the 1901 census, Annie was listed at Drummie as a 20 year old Farmer's Daughter, and a worker (GROS:1901/357/2/1). Annie eventually died in December 1955 and was buried in Fowlis Wester Cemetery, Perthshire. Andrew was born in Fowlis Wester, Perthshire, Scotland, on 5 AUG 1885. On 30 JUN 1890, Andrew started school, though unfortunately the school's name is not noted in the surviving register now hosted on Ancestry (Registers of Admissions and Withdrawals, CC1/5/8/91. Perth & Kinross Council Archive, Perth, Scotland). His father was noted as Mr. Comrie, his date of birth as 5 AUG 1885, and his address as Drummie. No previous school has been attended, and his date of leaving was not noted. In the 1901 census, Andrew was listed as a 15 year old scholar at Drummie Farm, Fowlis Wester (GROS:1901/357/2/1). In Novermber 1904 he sailed from Liverpool, England, on board the Bavarian, with St John New Brunswick his destination. He was noted as a 19 year old bank clerk, and from Perthshire, Scotland. (Ancestry.co.uk: Canadian Passenger Lists 1865-1935). In 1909, Andrew decided to emigrate to Canada. He was photographed with the station master and his brother John at Abercairney Station as he prepared to make his way to Perth, the first stage of his journey. He set sail from Liverpool on board the Empress of Ireland for Quebec, with his ultimate destination St. John, New Brunswick. His occupation was noted as a clerk (Ancestry.co.uk: Canadian Passenger Lists 1865-1935). At some stage after, he made his way south to the United States, eventually settling in Oregon. On February 10th 1967, Andrew died in Portland, Multnomah, Oregon, in the United States of America. His social security number was 543-38-4242. Andrew's ashes were returned to Scotland and scattered in Fowlis Wester Cemetery, Perthshire. On May 22nd 1873, Alexander married 22 year old domestic servant Mary Paterson (1851 - 30/11/1930), daughter of overseer David Paterson and Jessie Copeland in Fowlis Wester, Perthshire. The wedding, performed by the Reverend Thomas Hardy, took the form of an established church service, taking place at the Manse in Fowlis Wester in front of two witnesses, James Comrie and Ian Paterson. In the wedding entry, Alexander was described as a ploughman (GROS:1873/357/00/0003). At some stage after the wedding, the newlyweds moved to Perth, where they raised their family. 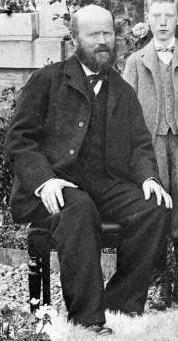 Alexander died at 11.05am on August 7th 1913, at 9 Speygate, Perth, aged 66. The cause was chronic ascending paralysis asthemia, as certified by Dr. R. Menzies. His son, David P. Comrie, of 4 Sunnyside Road, Aberdeen, informed the registrar on the 8th (GROS:1913/387/00/367). Annie was born at 115 South Street, Perth, at 9am on February 5th 1874. At this point her father was a grocer, and he registered the birth in the town on the 21st (GROS:1874/387/00/118). Annie married printer compositor James Ford on December 28th 1900 in Perth (GROS:1900/387/00/299), and the couple went on to have three children. Mary was born at 43 Canal Street, Perth, at 6.00am, January 19th 1902. Her father James, a printer compositor, registered the birth in Perth on the 28th (GROS:1902/387/00/0061). This son of Annie's is believed to be still alive. He registered his mother's death on February 26th 1951, and at the time was resident at 1 Cairns Crescent (GROS:1951/387/00/175). David was born at 56 Meal Vennel, Perth, on October 17th 1875. David married Aberdonian Isabella (Bella) Anderson at 9 Great Northern Road, Woodside, Aberdeen, on April 27th 1900. The couple went on to have four children. David died at Aberdeen Royal Infirmary on December 5th 1935, at 7.20am. The cause of his death was carcinoma ventricular and post operative broncho-pneumonia, as certified by Dr J. Davidson. At the time of his death, David had been living at 4 Sunnyside Road in Aberdeen. His son James informed the registrar on the 5th (GROS:1935/168/01/1155). David's wife Bella lived a further 26 years, and finally passed away on July 28th 1961 at Woodend Hospital, Aberdeen. David was born at 62A Bedford Road, Aberdeen, on October 11th 1900, at 4.55am. His father informed the registrar of the birth on the 30th (GROS:1900/168/2/1854). On January 7th 1943, David married Wilhelmina (Minnie) Leith Anderson. David died in approximately 1963 in Aberdeen, Scotland. Little is known of Robert at present. Annie was born at 62A Bedford Road, Aberdeen, on September 15th 1902, at 3.25am. Her father informed the Aberdeen registrar on October 3rd 1902 (GROS:1902/168/2/1704). Annie married 26 year old William Henry Wren (born 20/3/1901) on August 23rd 1927, at the Registry Office, 17 Union Terrace, Aberdeen. In 1946, several years after the birth of their son Anthony, Annie and William moved to Edinburgh. In 1971 they then moved over the border south to Leeds in England. William passed away on June 4th 1976, at 15A Hollin Gardens, Leeds, England, and after his death, in 1979, Annie moved to West Sussex. Annie eventually passed away herself on July 21st 1994, at 5 Hoathly Hill, West Hoathly, West Sussex, England. Anthony was born on July 17th 1936 at 261 Rosemount Place, Aberdeen, Scotland. Anthony married 23 year old Anne Felicity Thomas (known more colloquially as Felicity) at St. John the Baptist's Church, Chester, England, on July 25th 1964. Today Anthony continues to live in Harrogate, England. Andrew was born at Leeds Maternity Hospital in England on February 2nd 1968. Andrew married 31 year old Judith Elizabeth Ross (born:4/2/1969) at Westminster Register Office on November 4th 2000. David was born on June 14th 1970 at Leeds Maternity Hospital, England. David married 25 year old Katherine Rose Tan Lim, from the Phillipines, on March 9th 1997 at San Fernando Rey de Espana, Los Angeles, USA. Charlotte was born on June 22nd 2002 in San Diego, California, USA. Alexander was born at 98 Sunnyside Road, Aberdeen, at 5.45pm on October 28th 1906. His father informed the registrar on the 15th (GROS:1906/168/2/2004). On January 16th 1934, Alex married 24 year old Ethel Mary Harper (b:23/12/1909), in Kirkcaldy, Fife, Scotland. The couple moved to Bombay, India, where they raised a family, before eventually returning to Scotland, and settling in Aberdeen. On April 16th 1979, Alexander finally passed away in Aberdeen, aged 72. Ethel continued to live in Aberdeen, eventually passing away herself on April 16th 1991, exactly 15 years to the day her husband died. Sandy was born on December 12th 1936 in Bombay, India. Having returned to Aberdeen, on June 30th 1963 Sandy married 22 year old Margaret (Margot) Ramsay (b: 18/7/1940) at Woodside North Church in the city. Graham was born in Aberdeen on March 25th 1965. On June 26th 1986, Graham married 26 year old Heather Georgina Margaret Davie (b: 19/3/1960), in Aberdeen. Kim was born in Aberdeen on March 3rd 1987. Nicola was born on January 31st 1991 in Aberdeen. Alison was born on April 28th 1968 in Aberdeen. Alison married 25 year old Malcolm Thompson (b:25/4/1966) on July 17th 1991, in Inverurie, Aberdeenshire, Scotland. Lee was born on September 30th 1992 in Aberdeen. Cara was born on February 24th 1995 in Aberdeen. Isobel was born on June 1st 1942 in Bombay, India. On August 18th 1967, Isobel married 27 year old Wick man, James Sutherland Dunnett (b:29/10/1939) in the High Hilton Church in Aberdeen. Keith was born on March 31st 1970 in Aberdeen. Keith married 23 year old Aberdonian Aileen Isobel Finnie (b:13/10/1969) on July 10th 1993. Heather was born on January 10th 1999 in Aberdeen. Keira was born on November 30th 2000. Mark was born on February 26th 1973 in Aberdeen. Isabella was born premature in Aberdeen on October 28th 1908. Tragically she died two weeks later on November 13th at 12.45 am in her home at 98 Sunnyside Road. Her father informed the registrar on the same day (GROS:1908/168/02/0966). James was born in Aberdeen on Januray 2nd 1912. James married 26 year old Aberdonian Lily Mackie (b:19/4/1909) on February 5th 1936, in Aberdeen. On December 5th 1935 James had the unfortunate task of registering his father's death. At the time, he was living in the family home of 4 Sunnyside Road, Aberdeen (GROS:1935/168/01/1155). James and Lily moved to Berkshire, England, in the late 1960s. Lily eventually died in Runnymede, Surrey, England, on March 23rd 1977. James continued to live in England, eventually passing away himself on February 3rd 1994, in Maidenhead, Berkshire. Gillian was born in Aberdeen, Scotland, on August 24th 1940. On March 24th 1962, Gillian married William Craig McCaskill, at Mannofield Church Aberdeen. The couple had two children over the next two years, in England and Kenya, but divorced on January 29th 1970. Four years later, Gillian remarried to Michael John Ward, in Maidenhead. This wedding also ended in divorce on January 5th 1978. On September 27th 1985, Gillian married for a third time, this time to 41 year old Bristolian David Parry. The marriage took place on September 27th 1985 at Surrey Registry Office. Tragically David died on August 22nd 1999 in Toronto, Canada. Gillian still survives. Craig was born in Slough, Berkshire, England, on August 22nd 1963. On September 27th 1989, Craig married 29 year old Canadian Marion Alison McCormick (b:9/1/1960) in Orillia, Ontario, Canada. Mitchell was born on October 1st 1990 in Mississauga, Ontario, Canada. Shelby was born on August 30th 1992 in Mississauga, Ontario, Canada. Colin was born on October 18th 1995 in Bracerringe, Ontario, Canada. David was born in Aberdeen on December 23rd 1943. David married 20 year old Jennifer Anne Dickie (b:20/8/1945) in January 1966, and had two sons with her in the following years. However, he divorced Jennifer before 1984, and later remarried to Clare Uden (b:2/1/1953) in 1984. Martin married Jessica Jackson and currently has two children. Sean married Melissa Jane Goodall and currently has two children. Anne was born on November 16th 1945 in Aberdeen, Scotland. Anne married an Englishman, 20 year old Robert James Godfrey (b:23/7/1947), from Poole, on August 19th 1967, in the Registry Office at Windor, Berkshire. The couple have since gone on to have three children. Nicholas was born on December 17th 1967 at Eton, Buckinghamshire. Nicholas married 20 year old Kirsty Preedy, from Liss, Hampshire (b:4/5/1969) on March 23rd 2000, in the City Hall Registry Office in Central Hong Kong. Eleanor was born on December 4th 2000 at High Wycombe, Berkshire, England. Stephen was born on November 4th 1968 in Eton, Buckinghamshire, England. Kirstin was born on December 12th 1975 in Bracknell, England. On August 24th 2003, Kirstin married Christopher Brooks. Jessie was born in Perth on September 26th 1877. On June 17th 1910, 32 year old dyer's clerk Jessie married 32 year old master butcher William Graham Murray, son of factory engineman John Murray (deceased) and Grace Graham. At the time of the wedding, William was living at 30 George Street, Perth, whilst Jessie was resident at 8 Mill Street in the city, where the marriage was performed. The officiating Church of Scotland minister was the Reverend P. R. Landreth, of St. John's West Church parish, and the witnesses were Alexander Brown and Elizabeth Robertson Murray. The marriage was registered on the 21st (GROS:1910/387/00/124). Jessie died at 7.56pm on March 26th ?1948 at her home of 21 Unity Terrace, Perth. The cause was chronic pulmonary tuberculosis, as certified by Dr. J. Simpson. In the death entry she is described as a widow of William Graham Murray, butcher master, and daughter) of ? ?Alexander Comrie, brewer's bottler, and Mary Comrie, afterwards Petrie, ms Paterson (GROS:1948/387/00/174). Jessie was buried in Perth. Peter was born in Perth on April 17th 1881. On 18 OCT 1889, Andrew started school at Perth North Port (Registers of Admissions and Withdrawals, CC1/5/8/67. Perth & Kinross Council Archive, Perth, Scotland). His father was noted as Alexr. Comrie, his date of birth as 17 APR 1881, and his address as 8 Mill Street. No previous school has been attended, and his date of leaving was not noted. On October 25th 1907, 26 year old Peter, resident at 16 Shiprow, Aberdeen, and working as a cooper (journeyman), married 25 year old linen weaver Flora Gray Harris, daughter of mason James Harris and Mary Jane Gray, and resident at 48 George Street, Perth, where the marriage ceremony was performed. The officiating Church of Scotland minister was the Reverend Walter E. Lee, and the ministers were Alexander Comrie and Jeannie Harris. The wedding was registered on the 26th (GROS:1907/387/00/241). Helen was born in Perth on April 4th 1883. On 21 AUG 1889, Helen, noted as 'Nellie', started school at Perth North Port (Registers of Admissions and Withdrawals, CC1/5/8/67. Perth & Kinross Council Archive, Perth, Scotland). Her father was noted as Alexr. Comrie, her date of birth as 4 APR 1883, and her address as 8 Mill Street. No previous school has been attended, and her date of leaving was not noted. Alexander was born on April 19th 1886. On 15 APR 1890, Alexander started school at Perth North Port (Registers of Admissions and Withdrawals, CC1/5/8/67. Perth & Kinross Council Archive, Perth, Scotland). His father was noted as Alexr. Comrie, his date of birth as 19 APR 1886, and his address as 8 Mill Street. No previous school has been attended, and his date of leaving was not noted. On March 4th 1910. Alexander married 21 year old woollen factory darner Euphemia Kelty Wilkie, daughter of Glassworks packer James Wilkie and Margaret Jane MacDonald. At the time of the wedding, Alexander, working as a dyer's finisher, lived at 8 Mill Street, Perth, whilst Euphemia lived at 56 Pomarium. The witnesses were David Sinclair and Ruby Leathley, and the minister was the Reverend John Addie, of the Wilson United Free Church, Perth. The service took place at 56 Pomarium (GROS:1910/387/00/48), and was registered on the 7th. Mary was born in 1914 and named after her aunt, who had died at the age of 3 in 1924. But this Mary was to have an equally tragic lifespan. At 10.00am on November 9th 1924, Mary died at the City Hospital in Perth from scarlet fever, as certified by Dr. L. P. Stewart. Her father, residing at 7 Paul Street in the city, informed the Perth registrar on the following day. Mary was born in Perth on May 18th 1888. Mary lived a short life, passing away at 8 Mill Street Perth, on December 3rd 1891, at 6am, after suffering two days convulsions. Her father informed the Perth registrar on the same day (GROS:1891/387/00/571). Jeannie was born in Perth on August 31st 1893. No school record has been found for Jeannie. On March 30th 1922, Jeannie, at this stage working as a dyer's despatcher, married 34 year old gardener George McKenzie Weir, son of farmer John Weir and Georgina McKenzie. The wedding was carried out by the Reverend P. K. Landreth, minister of St. John's West Church, Perth, at 8 Barossa Place in the town. The witnesses to the event were Isabella McDougall of 217 High Street, Perth, and John Weir, of 488 Cathedral Street in Glasgow. At the time of the wedding, George was resident at Collenan, Troon, whilst Jeanie was living at 8 Barossa Place. The marriage was registered on April 3rd (GROS:1922/387/00/74). After the wedding, the couple moved to Ayrshire, intending to raise a family. But tragically, Jeanie died in the infirmary at Kilmarnock at 4.45am, on June 23rd 1923, her usual residence being recorded as No. 5 Holiday Loans, Troon. She was only 29. The cause of her death was eclampsia (post natal), suffered for three days, as certified by Dr. Elizabeth I. Inglis. Her husband George registered the death on the same day (GROS:1923/597/00/230). Jeannie is buried in Mauchline, Ayrshire, Scotland, whilst George, who died on April 1st 1962, was later buried in Kilmarnock. James worked throughout his life as a joiner, and never married. He died at 9.10pm on January 20th 1918, at Fowlis Village. The cause was arterio sclerosis and a cerebral haemhorrage, as certified by Dr. Alex Stuart. James' nephew, Alexander Comrie, informed the registrar on the 22nd (GROS:1918/357/000/001). James is buried in Fowlis Wester graveyard. Peter was born in Muthill, Perthshire, in approximately 1852. Peter worked on Drummie Farm, in Fowlis Wester, Perthshire, for his brother Andrew. In the 1901 census he is recorded there as a Farmer's Brother, aged 48, and as a worker (GROS:1901/357/2/1). Peter died in 1928 and was buried in Fowlis Wester graveyard. Ann was born on February 25th 1855 in Muthill, Perthshire, Scotland. On January 12th 1888, Ann married John Kinloch, son of Robert Kinloch and Amelia Morris, who was born 14/11/1842 at Madderty, Perthshire. The couple went on to have five children at Ferneyfold Farm in Madderty, Perthshire. DEAD, YET SHALL HE LIVE"
Annie was born in Madderty, Perthshire, Scotland. Robert was born in Madderty, Perthshire, on July 26th 1890. Robert married and had six children, although little is known about his wife and family. Amelia was born in Madderty, Perthshire. Janetta was born in Madderty, Perthshire. Janet never married, and died at 11.50pm on March 20th 1937, at Ochilview, Fowlis Wester village, aged 78. The cause was senile degenration, as certified by Dr. A.H.Kintoul. Her nephew Alexander Comrie informed the registrar at Fowlis Wester (GROS:1937/357/000/004). Janet is buried in Fowlis Wester graveyard. Mary was born in Fowlis Wester, Perthshire, Scotland, on May 5th 1861. Mary married farmer Andrew Crerar Walker (born 1869), in Methven, Perthshire. Andrew passed away on November 21st 1940, and was buried in Methven New Cemetery. Mary eventually passed away on September 13th 1942 in Methven, and she too was buried in Methven New Cemetery. Andrew was born in Methven, Perthshire, Scotland. He died in December 1961 and was buried in Methven New Cemetery. According to the gravestone, Andrew was the youngest son, indicating the existence of siblings as yet unfound. Catherine was christened in Madderty on December 11th, 1823. Mary was christened in Madderty on January 14th, 1827. John was born in Madderty on April 25th 1830. He worked as a joiner throughout his life, and married Mary Murray prior to 1853. On April 26th 1855, John registered the death of his mother Ann Reid at Madderty registry office (GROS:1855/378/00/3). John died on November 13th 1914 at 12.05pm, at his home in Dabheads, Madderty, aged 84. He was a widower at this point. The cause was senile decay and cardiac failure, as certified by Dr A. Stewart. The death was registered by his son-in-law Thomas Birrell. Catherine married Thomas Birrell on July 20th 1877 in Madderty, Perthshire. Catherine and Thomas had at least one child. 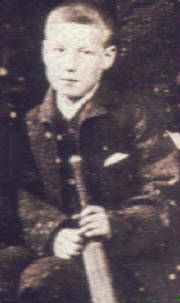 Thomas was born at St. David's, Madderty, at 1.00pm on April 28th 1881. His grandfather, John McOwan, informed the Ardbennie registrar on May 15th (GROS:1881/378/0/6). Andrew was born at 2.00pm on January 7th 1856, in Madderty, Perthshire. His father John, listed as a carpenter, and present at the birth, informed the registrar on the 17th (GROS:1856/378/00/001). Janet was Calum's and Jamie's geat great great great grandmother - see below. Janet McEwan was Calum's and Jamie's great great great great great grandmother. Although it is not yet knwon exactly when Janet died, it is known that she died from cardiac failure, as identified in a family medical history recorded in the asylum records for her son William Henderson. Janet was certainly dead before the 1851 census at Forgandenny, where her husband Andrew is noted as a widower. Janet was born in Kinclaven, Perthshire. For more on Janet visit the Henderson page, and also the Mount Stewart Farm Murder page. William was born in Kinclaven, Perthshire. Henderson - William Henderson son of Andrew Henderson (Airntully) and Janet McEwen was born March 29th 1813. For more on William visit the Henderson page, and also the Mount Stewart Farm Murder page. Isobel was born in Kinclaven, Perthshire. For more on Isobel visit the Henderson page. Margaret was born in Kinclaven, Perthshire. For more on Margaret visit the Henderson page. Janet McEwan married Andrew Henderson in 1809.